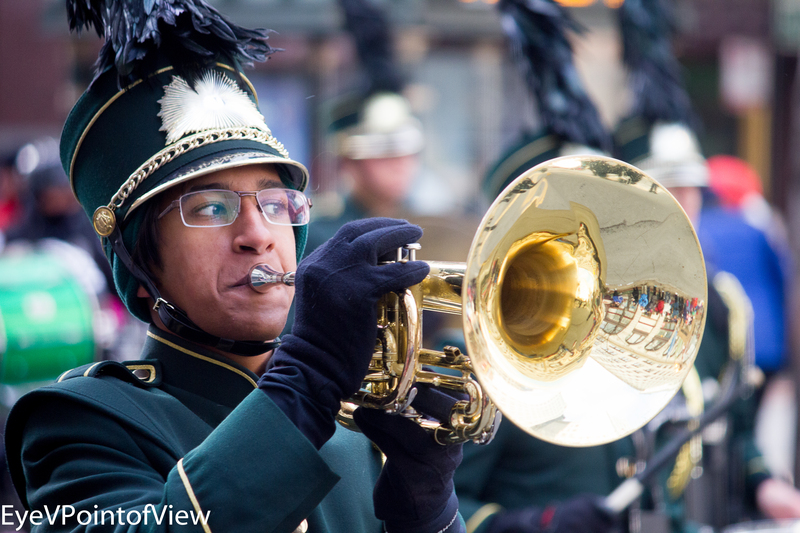 The sun was only out for a few short hours today, and as luck would have those few hours occurred during today’s Thanksgiving Day Parade in Chicago. 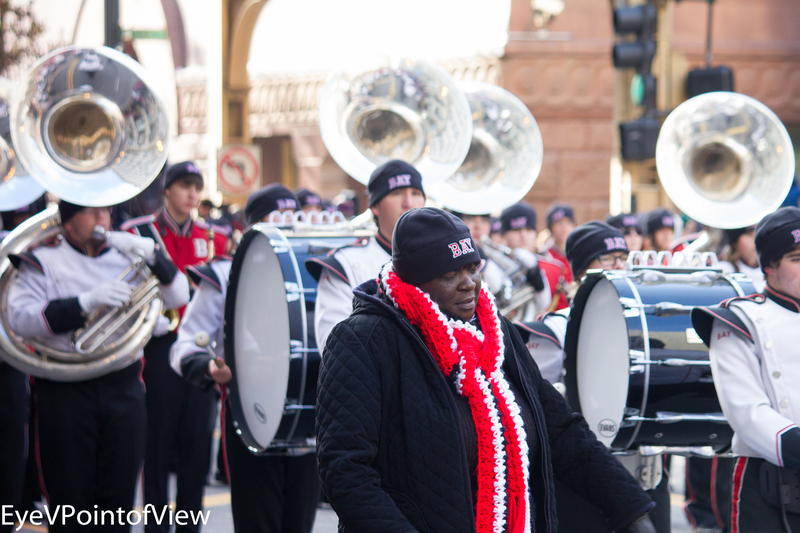 And Chicago knows how to do parades – live performance acts from local theaters, hot air balloons, local and national dance troupe and bands. I always enjoy this event, and because I have photographed it several times before, I challenged myself to come back with a different set of images than I have in the past. 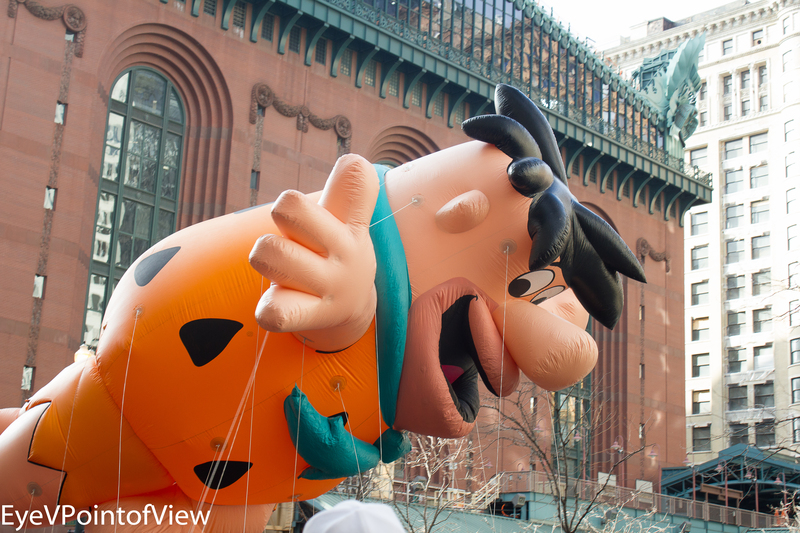 Fred Flintstone – Cartoon characters are always my favorites, and with the Harold Washington Library as a backdrop, I couldn’t miss with this combo. I love fact that you can see the reflections in the glass windows, courtesy of the day’s sunlight. 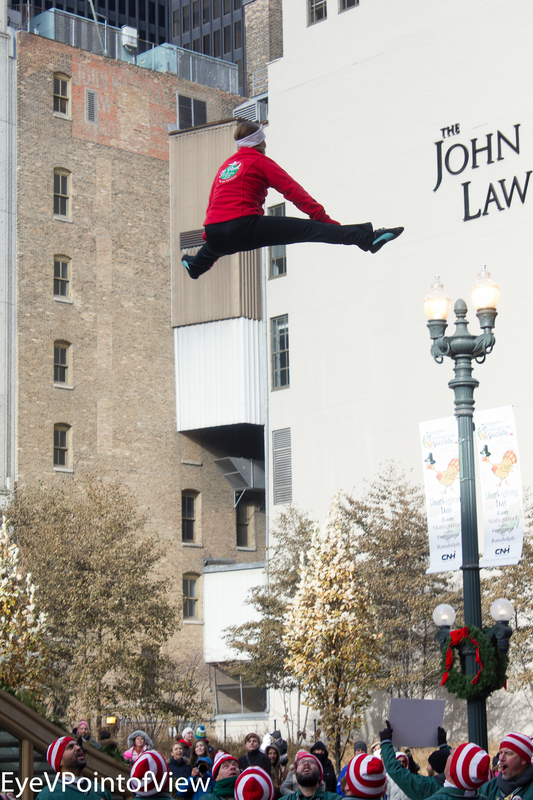 Lamp Post High – The St. Paul (MN) Bouncing Team bouncer has reached the height of the street lamp. 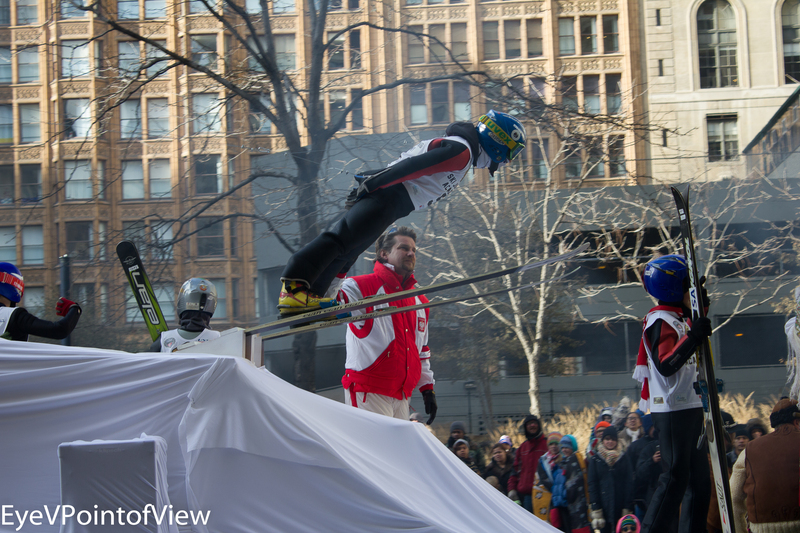 Their leader involved the crowd in the “one- two- three- up she goes “ chant, leading to these super high jumps, at least 18 feet, which is the height of the street lamp. 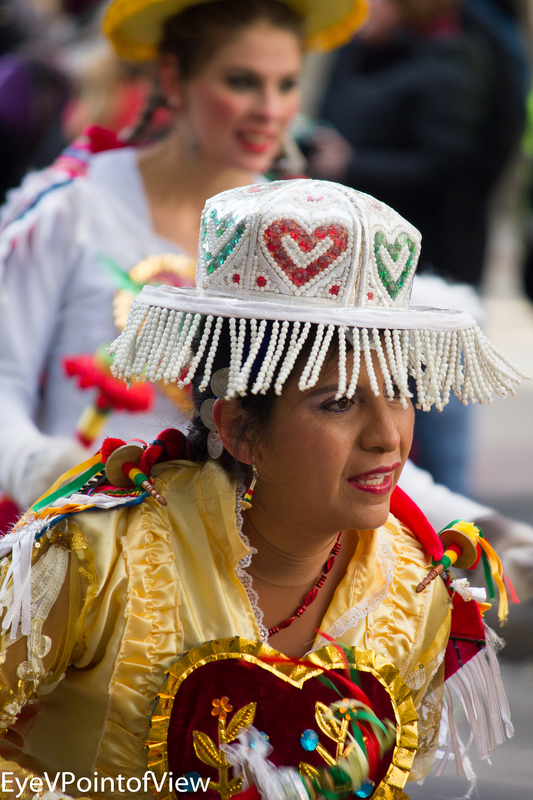 Dance Troupe Renacer Boliviano – These Bolivian dancers have brought their colorful outfits and traditional dance to the Thanksgiving Parade in the past. 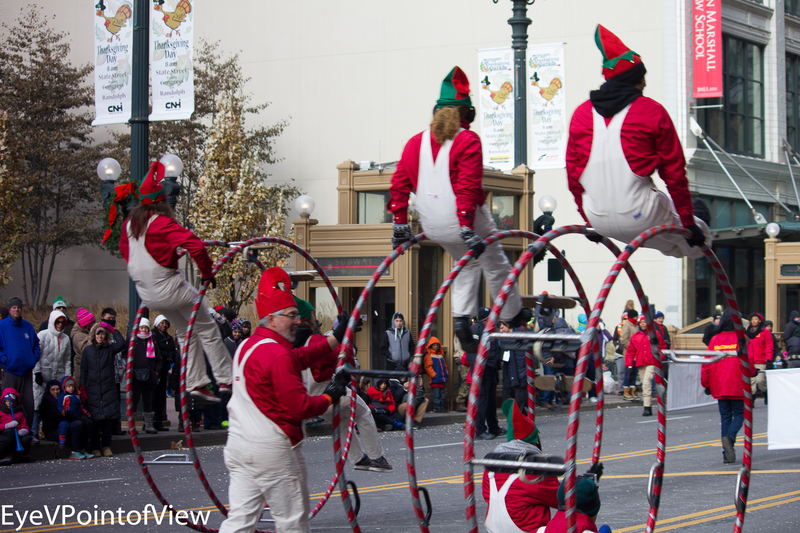 Each year, they entrance us, and this year was no different. 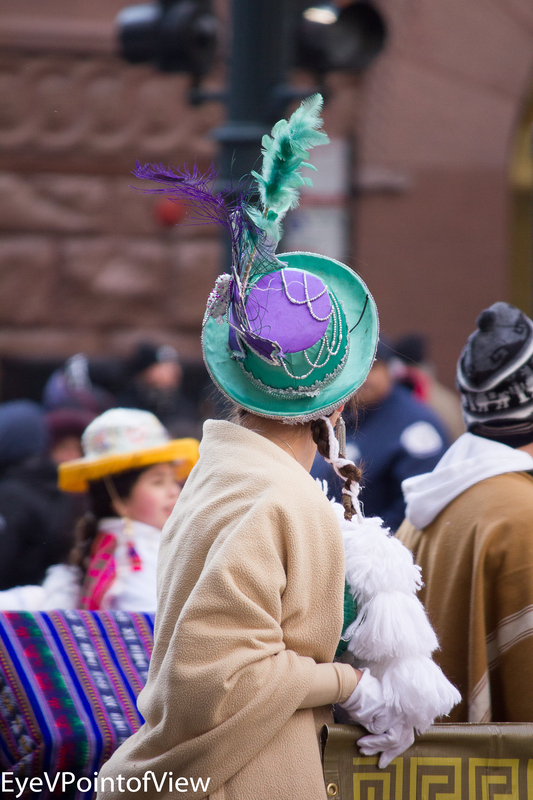 I’m a hat person myself, so it is no wonder the spectacular head gear caught my attention! 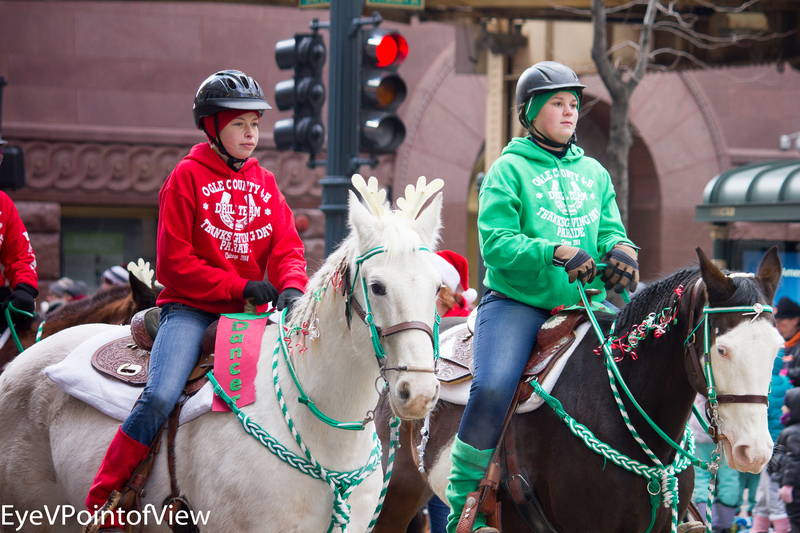 Braids ‘n Ribbons – The Ogle County (IL) 4H Drill Team brought their finest horses to the parade and dress them up extra special in their holiday finery. 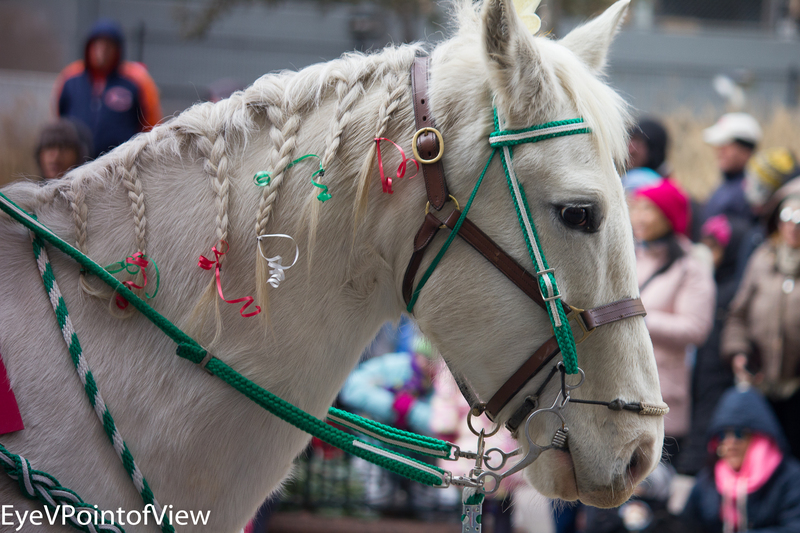 The beribboned braids provide added flair to the equestrian holiday style. 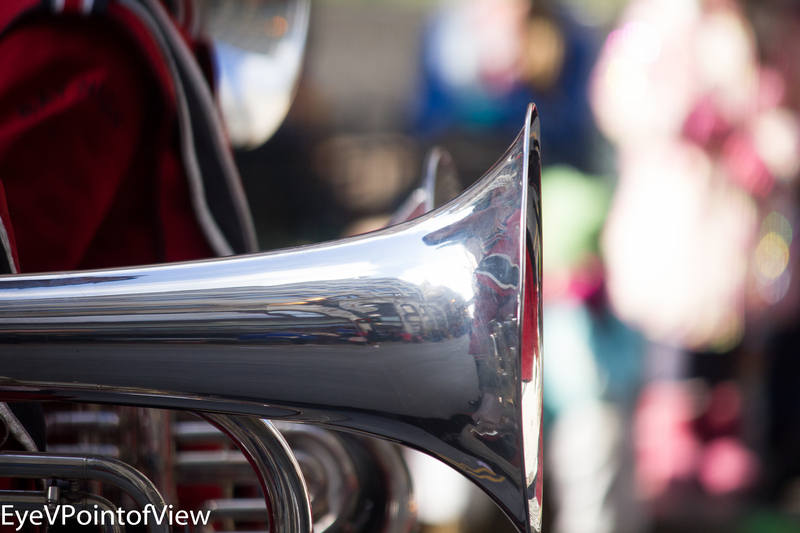 High School Bands – The bands are always a highlight of any parade. They come out in huge numbers, their vivid colors and plumage are eye-catching, and the crowds sing and dance along as they play. 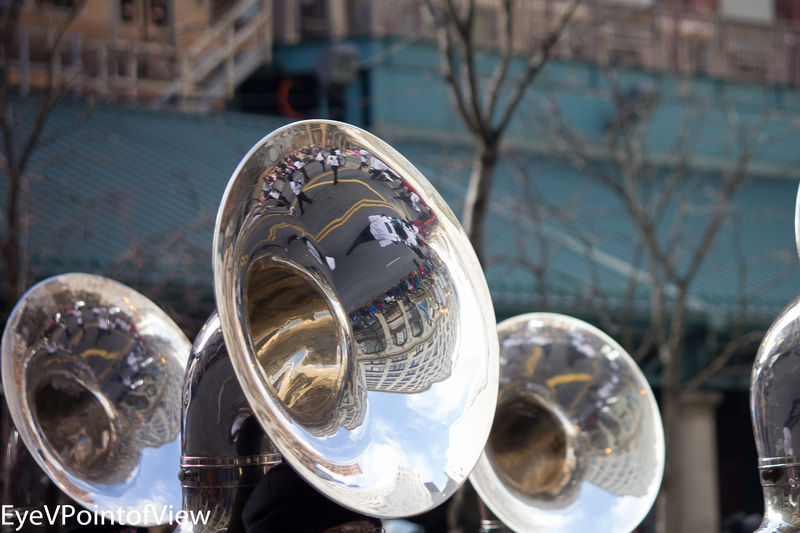 First, it’s the Greeneville (TN) School Band, then the Bay High School Band (Panama FL). 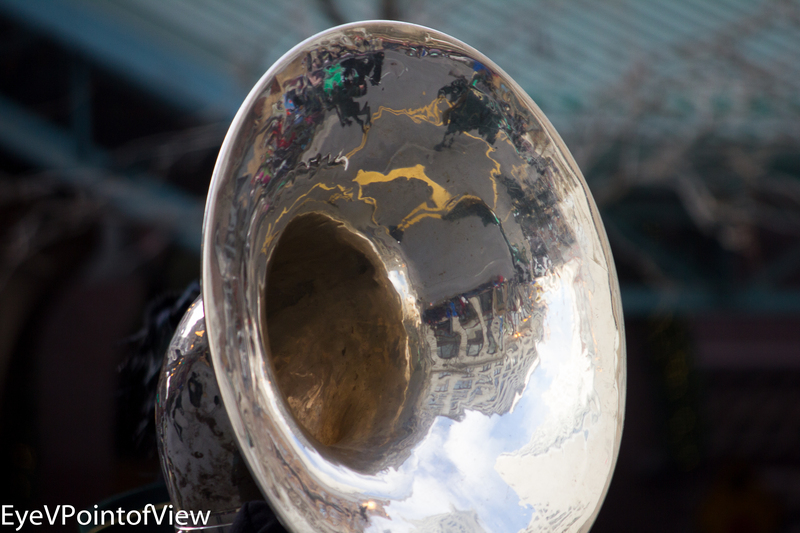 Eyes Wide– This Greeneville band member was all eyes throughout the performance. High School Dance Team — And then there are the dance teams. 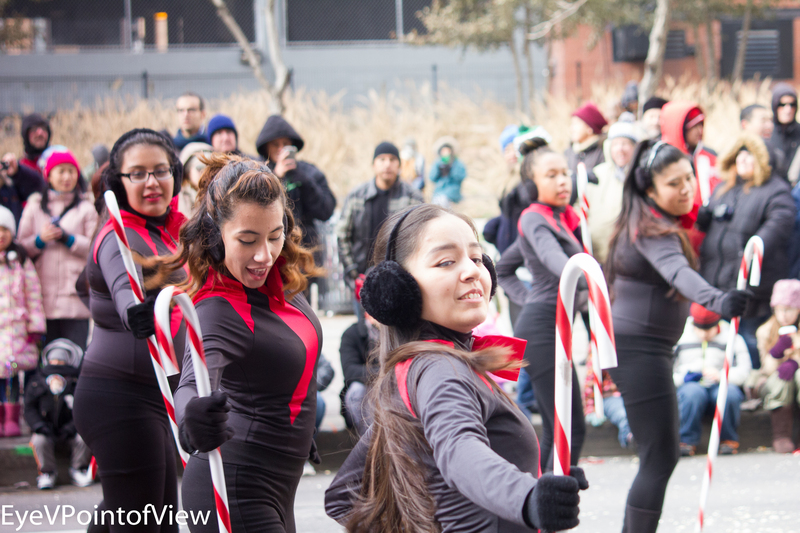 I love the energies the dancers exhibit — both concentration and fun in holding the candy canes, jumping and hopping to the beat, and in the lean-back move. Wheel Jam – The Cirques Experience Wheel Jam is a fascinating performance. How do the wheels move and the players stay upright???? Inquiring minds want to know. 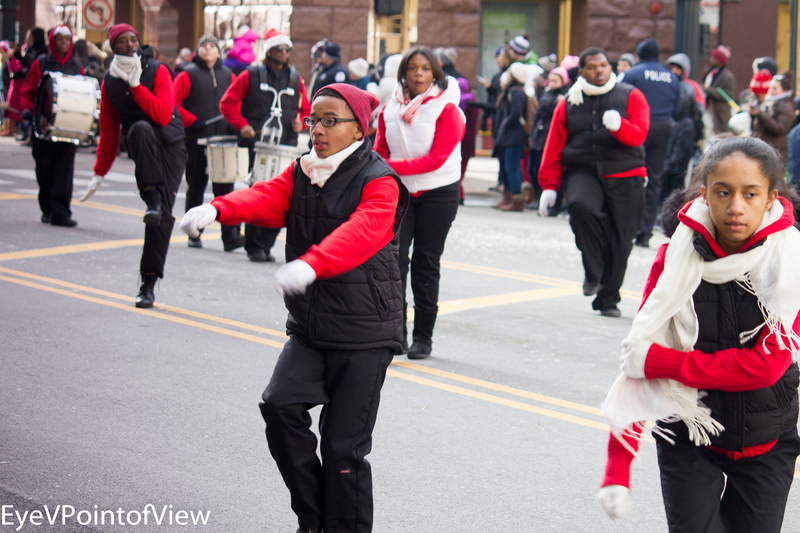 The Thanksgiving Parade, one of my favorite events, didn’t disappoint. 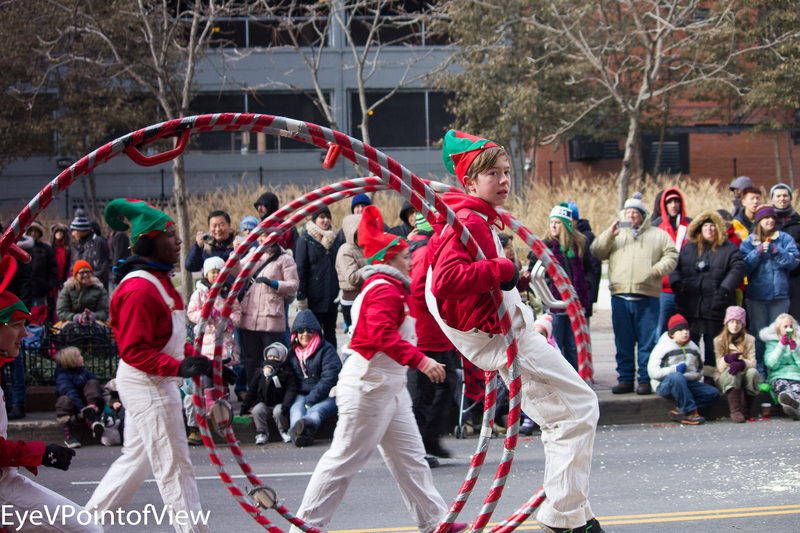 Lots of images, and because the day was so beautiful, many seemed spectacular. Hope I didn’t choose too many for you, and I hope you enjoy these 5 * selections.